sire: DK & Fin Ch KBHW-02 Special Reserve du Haras d'Hélios"Special"
dam: Fin & Est Ch Plaudite Night Life "Nette"
Our B-litter has been one of the hardest experience of my life. Nette had three puppies, two beautiful girls and one handsome boy. Unfortunately the first girl was born dead and the second girl didn't live to see the next morning. 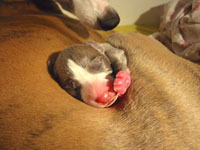 The only boy "Rudi" was also too weak, so we sadly lost him on the fourth day. These days were overwhelming to all of us, especially to Nette who tried her best for her puppies but lost them anyway. All three puppies are deeply missed, but especially the little boy who charmed us completely. "Before the summer turns to winter, before the dreams will turn to snow. But I'll be back before the summer, next year you're in my arms again. The winter breeze will send my message, it will keep you warm until then. The path to home is long and winding. I'll keep the flame alive for you until I am back. I'll show that all the dreams are true if you only let them be.